These AllGrip Boots are non-slip, waterproof and a lighter version of our Tough Boots with Grip utilizing just the Grip fabric. This new Grip fabric is soft on the inside with super Grip on the outside and has a slight stretch to it for great comfort. 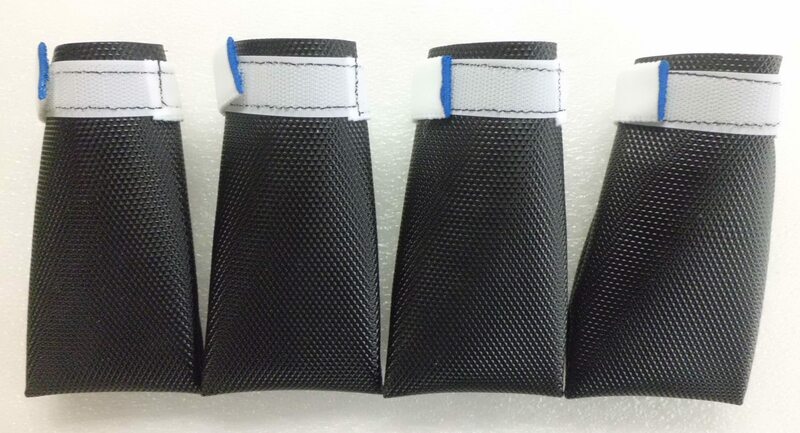 We use the same great stretchy Velcro as the rest of our booties to keep them on your dogs feet where they belong. The color is black and they come in sizes XXS, XS-Short, XSmall, Small, Medium, Large, X-Large. These have a good grip on them, are water proof, and for the most part do a good job of staying in place once fastened. I bought these for my 50 lb medium-sized shepherd mix to wear over a wrapped paw as he heals from a paw pad injury. He has small paws, and the small fits well once everything's wrapped up; I also bought the medium, which fits snuggly (in a good way) when the vet has to wrap the bandage a little thicker. I can't speak to the durability since we're mostly using them to help keep the wrap clean/dry while out for walks or at the dog park rather than long runs; but so far, so good.